The public’s fixation on celebrity is fascinating. People become obsessed with public figures and getting close to celebrities. The most obsessed will do anything to get close to their favorite stars and to get to the top. 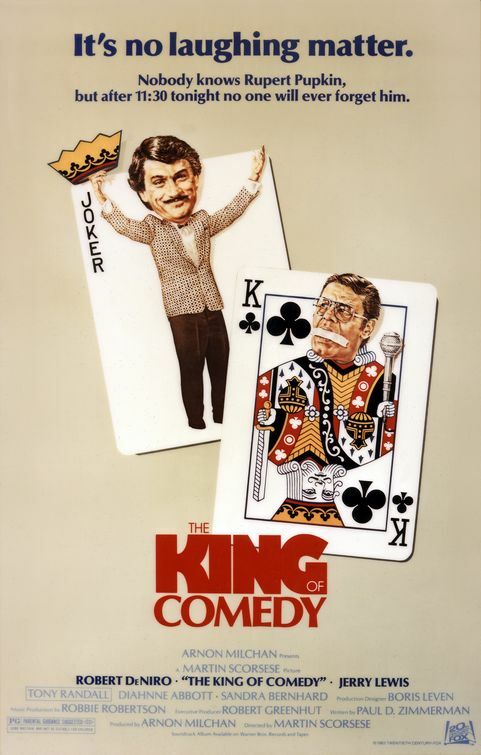 Martin Scorsese’s 1983 film The King of Comedy tackles celebrity stalking head on through a character who is both crazy about a late night comedy host and crazy to become a comedy legend himself. Robert DeNiro portrays Rupert Pupkin, an unfunny, struggling comic who latches on to late night talk show host Jerry Langford (Jerry Lewis) after a chance meeting. Pupkin, a man with some obvious mommy issues, thinks his new “friend” will help his comedy career. But when Rupert realizes otherwise, he takes matters into his own hand to become the new King of Comedy. Like so many movies, The King of Comedy foreshadows this celebrity obsessed culture we live in. It does so through comedy. Sandra Bernhard plays one of Rupert’s fellow stalker friends named Marsha who is so hilariously unhinged because of her desire to have just one date with Jerry Langford. But there is still a level of eeriness behind all of this because the fixation on celebrity never fades. After watching The King of Comedy, I listened to an interview with Brad Pitt on NPR’s Fresh Air. At one point he talks about his life and his family and how they deal with the “stalkerazzi”. It was an interesting interview to listen after seeing this movies. The King of Comedy shows what happens when off balance people hound celebrities but Jerry Langford is a mostly one-dimensional curmudgeon who has been beaten down by show business. This interview with Brad Pitt shows how one of the biggest celebrities in the world talking frankly about what it is like to be a person living as the public watches your every move. Both the movie and the interview are fascinating and worth your time. This post of is part of my Birthday Blitz Marathon.